An active performer and accomplished musician, Jennifer Mansour enjoys performing frequently, both in solo and collaborative environments. Jennifer is available to play for events such as weddings, receptions, and parties in the Edmond and Oklahoma City area. 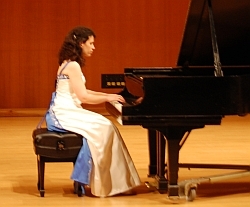 She can also accompany vocalists and instrumentalists for competitions, recitals, etc.